After six years of having our Southwestern Seminary at Darrington prison — for men — we have now gone to work to establish a similar seminary for the women in Texas prisons. With the full cooperation of our partners — TDCJ, Southwestern Theological Seminary, Lieutenant Governor Dan Patrick, and Senator John Whitmire of the Texas Criminal Justice Committee — we are now going through the prayerful process of establishing the Texas Women’s Prison Seminary. More on this effort in future Newsletters! The above picture was taken on our first visits to identify in which of our women’s prisons the new seminary will be located! 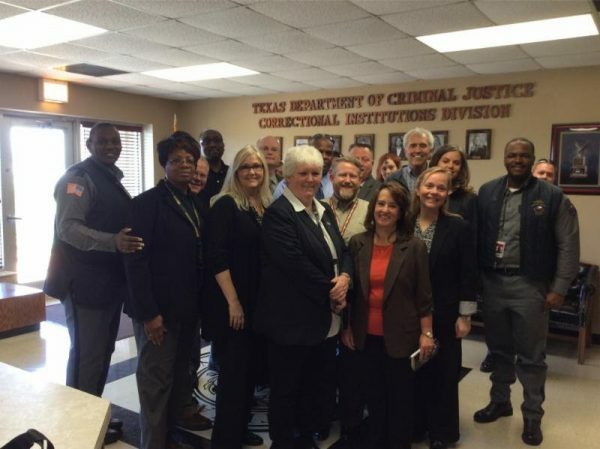 Pictured above are Regional Warden Melodye Nelson and other TDCJ officials, as well as Southwestern Seminary Women’s Dean Dr. Terri Stovall and her associate, Dr. Candi Finch, who along with other female faculty will be teaching in the new women’s seminary. Of course, we know that the greatest asset any prison system has is the inmate who has been spiritually transformed into a moral inmate. And we know there is no better way to help that process that to expose inmates, both male and female, to the Gospel of Jesus Christ. It’s a proven fact. The changed lives prove it. Please pray for funding and favor as we proceed with this incredible opportunity. It is something only our God could do. And years ago He did it in the men’s prison at Darrington. We’re trusting He will do it again, in the women’s prison at Hobby. >The location has been chosen for the new women’s seminary: The Hobby Women’s Unit, in Marlin, Texas. There are approximately 1325 women here, in this maximum-security penitentiary. This selection was made through the combined input from the Texas Department of Criminal Justice, the Southwestern Seminary, and The Heart of Texas Foundation. >The process. We will be working carefully and thoughtfully with all of our key partners as we move forward. There are many moving parts to creating a seminary within a prison system. We are thankful for the success of the men’s seminary at Darrington, and pray our experience there will help this process go smoothly. >The Funding for this second school is now needed. Funding needs here will be significant: it will be a second fully-accredited seminary for us to undertake. If you feel like you would be ready to make an investment into our ongoing, proven work, we encourage you to call or write us at POB 110, Bellville, Texas 77418. Email is grove@heartoftexasfoundation.org, or please call Grove Norwood on his cell phone at 281-850-8103. The Hobby Unit for Women, a maximum-security facility in Marlin, Texas. Click here to read a summary of recent research on the incarcerated women in America.